Posted on May 11, 2012 by Melanie B. Since my daughter broke her collar she has been in the house all week. She is obviously not feeling well and is in pain. Today, she was feeling a bit better so I told her I would take her to the movies. 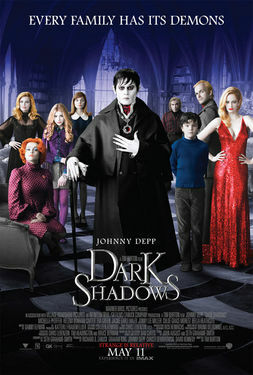 We had seen the preview for the movie “Dark Shadows” starring Johnny Depp a few times. The previews for the movie looked hilarious. So, I took her and and two of her friends with us, as well. “Dark Shadows” is rated PG-13. We have seen other movies with the same rating such as “Transformers” and “Pirates of the Caribbean.” So, I did not think twice when I saw “PG-13” as I looked up the movie times. I should have thought twice. The preview to this movie may have been the most misleading preview I have ever seen. I laughed through the entire 2 minute and 33 second trailer. Now, I think they squeezed in every funny part of the movie during those 2 minutes. There were a lot of other kids in the movie theater, as well. I was not the only person duped by the previews. The first preview before the movie started was “Madagascar 3: Europe’s Most Wanted.” It’s a cartoon. The next preview was “Gangster Land.” It was not a cartoon. The rest of the previews were Rated R previews. Who plans the preview line-up for a particular movie? How can a movie theater jump from a cartoon preview to a gangster preview? Once the movie started… there was a lot of blood. It was fake and bright red, but it was still blood. Everything was over-the-top fake, so I am assuming this is how they got the PG-13 rating. But, to three kids (and a mom/chaperone) that were expecting a comedy, it was shocking. Not only did I traumatize my own kid… I had my friend’s kids with me! I must have said 47 times… “Kids, I’m so sorry… this is supposed to be PG-13” or “How can this be rated PG-13?” My comments were endless, but they all involved my shock at the rating. When the movie was over… I did my “walk of shame” and told the neighbor girls I would call their mom to let her know the movie was not what I expected. My friend was more than kind and hopefully not mad at me for bringing her kids to see… a horror movie that earned a PG-13 rating. I thought I did my homework. I watched the trailer several times and saw the preview in the movie theater. I assumed it would be tame. I thought it would be just another comedy. I missed the part that listed the movie as a comedy horror. I only noticed that bit when I sat down here to vent about my discontent about the rating. I still don’t think horror and PG-13 belong in the same sentence. I guess I am wrong. Hopefully, nobody will have nightmares about fake blood and vampires tonight. Next time I bring my kids to the movies and the movie is not rated with a solid G… I will read every, single descriptive word that Fandango offers. Especially if I am bringing the neighbor kids with me.